- “We are looking forward to continue to support FMV and deliver technical support for the amphibious systems. The framework agreement has options to be extended until 2020”, says Magnus Forsberg, SSPA. For SSPA, this means supplying the administration with support in newbuilding and conversion projects with feasibility studies, technical project management, technical specifications, maintenance planning, documentation, design, testing and trials, and administrative support. One example is the recently completed project, a "make-over" and conversion of HMS Skaftö (link to text and video clip on www.fmv.se, in Swedish). HMS Skaftö and Niclas Dahlström, Project Manager at SSPA. 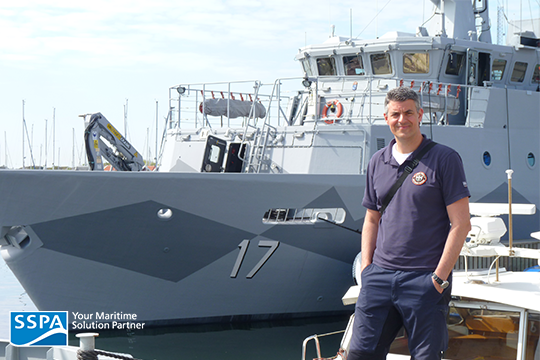 SSPA has a long history of supplying consultancy services in support of the development of the Swedish Armed Forces’ marine systems (surface ships, submarines and amphibious systems), primarily on behalf of the FMV. Among other things, SSPA has provided FMV with expertise and consultancy services in a number of technical fields within the Visby class Corvette project.